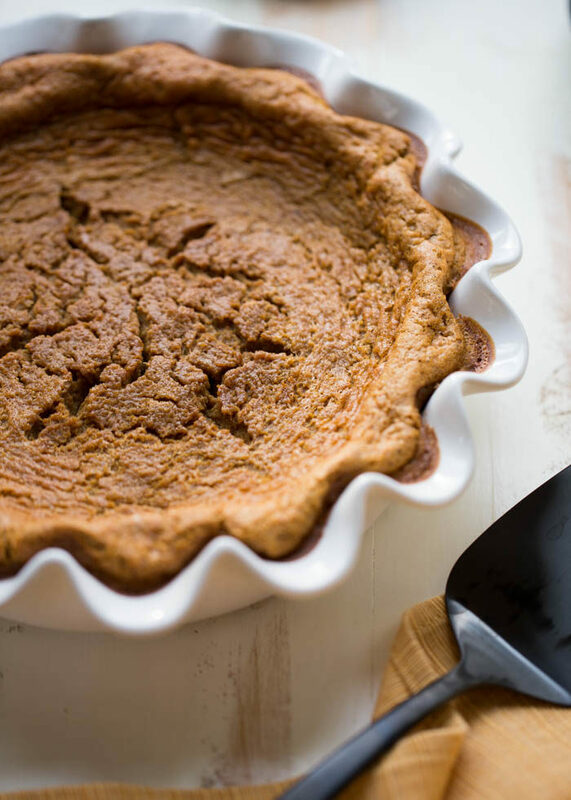 This crustless pumpkin pie might just be the easiest you’ll ever make. Simply blend the ingredients together, pour into your pie pan, and bake! I have to admit that pie, in general, is not my forte. It’s a crust thing. I love to eat it, but as far as making it goes, I have never mastered that supremely tender flaky crust situation. And the fact that I have to eat dairy-free just throws another monkey wrench into the whole deal. That’s why the concept of impossible pumpkin pie intrigued me. The idea is that you don’t have to make a crust; it magically makes its own crust right in the pan while it bakes! Say what now? I’m in! Well, the truth is, impossible pumpkin pie comes across more like a crustless pumpkin pie than one with a crust. But it’s still a bit magic. It slices and comes out of the pie pan just like a pie with crust, in perfect pie wedges. 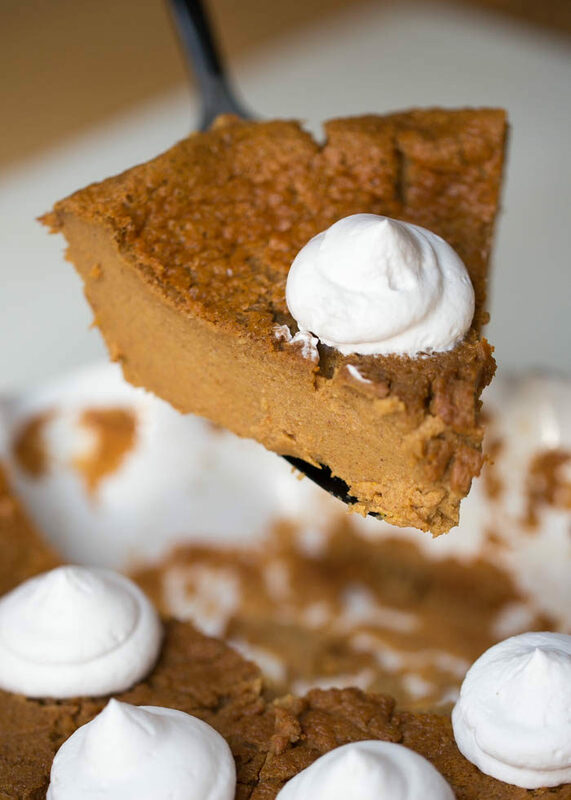 Plus, it’s just about the tastiest pumpkin pie around. 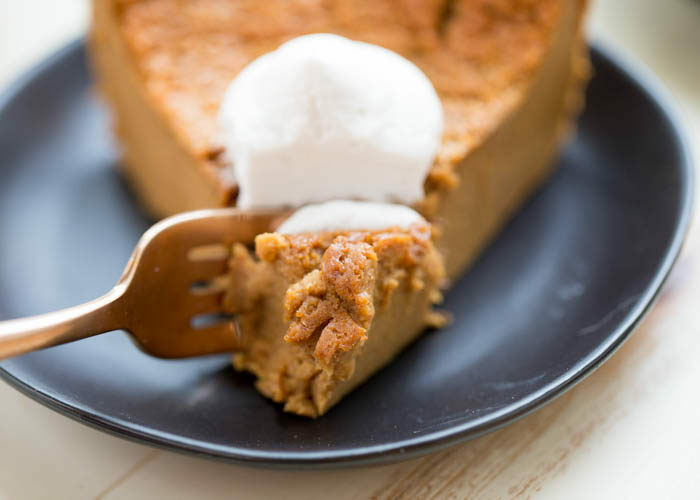 My fascination with the idea of impossible pumpkin pie joined up with my desire to create a dairy-free pumpkin pie with coconut milk. And so I started with this recipe, which apparently hails from a 1980’s LA Times cookbook. I experimented a lot (a LOT) with this one, ultimately replacing the milk and butter with a can of coconut milk; replacing the Bisquick with flour and baking powder; and adding some vanilla. You literally throw it all in the blender, mix it all up, then pour it into your pie pan and bake. That’s it. 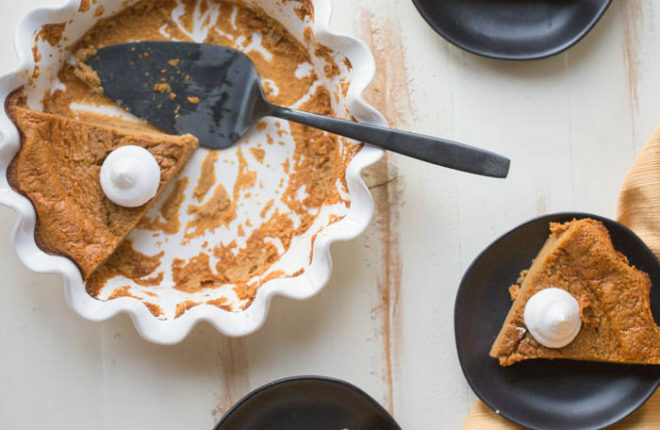 Seriously, the easiest pumpkin pie you might ever make. I also experimented with a gluten-free flour blend instead of the all-purpose flour, and it turned out great! Ultimately the result may depend on the blend you use (I’d steer clear of bean-based blends, personally). More about the brand I used in the recipe. I’m actually really proud of this pie recipe. While I have yet to master crust, I’ve at least mastered a dairy-free pumpkin pie without crust. So that’s something! Preheat oven to 375 degrees Fahrenheit and position rack in the middle of the oven. Spray a 9- or 10-inch pie pan with baking spray or oil the pan with coconut oil or vegan butter. 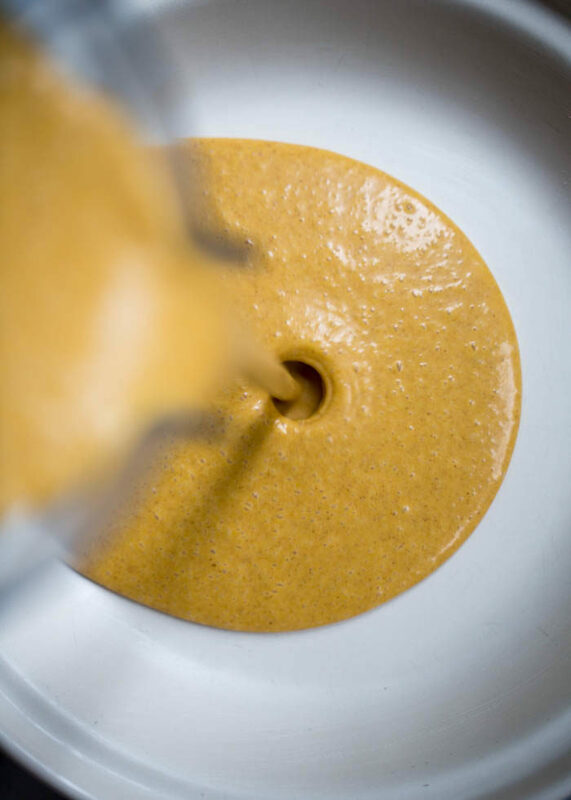 Add the coconut milk, pumpkin, eggs, sugar, and vanilla to the pitcher of a blender. Blend until combined, about 20 seconds. Add the flour, baking powder, pumpkin pie spice, and salt. Blend again until well-combined, another 20 seconds. Pour filling into the pie plate. The mixture will be fairly runny. Carefully transfer to the preheated oven. Bake until the middle just barely jiggles, 40-50 minutes. I like to check the middle by giving the pie pan a little nudge, and if it seems like it’s no longer liquid, I’ll pull the pie out and insert a butter knife about halfway between the center and the edge. If the knife comes out relatively clean – no runny pie filling – it’s done! Place on a cooling rack and let cool, about 1 hour. Transfer to refrigerator to completely cool, at least one more hour (or up to 3 days in advance). If desired, top pie with dollops of coconut whipped cream. Or simply cut slices, transfer to a plate, and top individual servings with the whipped cream. Keeps in the refrigerator for 3-4 days. I suggest covering the completely cooled pie with plastic wrap if not serving right away. * I have tested this pie recipe with only one gluten-free flour blend, and it turned out great! I used Pamela’s Gluten-Free Artisan Flour Blend. ** To make coconut whipped cream, refrigerate 1-2 cans of full-fat coconut milk. Skim the coconut cream off the top and place in a bowl. Whip with a hand mixer until the consistency of whipped cream. Add a bit of powdered sugar or pure maple syrup to sweeten, to taste, and/or a bit of vanilla extract if desired. To freeze, let cool completely then wrap well in plastic wrap and transfer to freezer. To thaw, transfer to refrigerator 24-48 hours before serving or let sit at room temperature for 2-3 hours. Adapted from LA Times via Cookistry. Wow! this sounds amazing, especially with the gluten-free option. I’ve been using King Arthur’s 1-for-1 gluten free flour and I think it will be perfect for this recipe. Yay, if you try it please report back how you liked it! I’d love to share more “approved” brands of GF flour as I only tested it with the one brand. Thanks! The King Arthur GF 1-for-1 flour seems to have worked very well, considering I used fresh pureed pumpkin (which I drained for some time before mixing in). Another substitution I made was to use palm sugar instead of cane sugar. The flavor was good, but next time, I’m going to use a little more palm sugar. I also plan to get some canned pumpkin. Can you tell that I love this recipe??!!?? I love that this recipe is dairy free ! Can the sugar and salt be reduced at all? I have to watch these two ingredients for a month under Doctor’s orders but would love to enjoy a dessert during the holidays! Hi Liz, you can leave the salt out entirely. The sugar … hmm, I’m less confident about that one. It is fairly sweet so maybe you could go down to 1/3? I did try this with pure maple syrup instead of granulated sugar but I found it affected the texture too much. This recipe looks great! 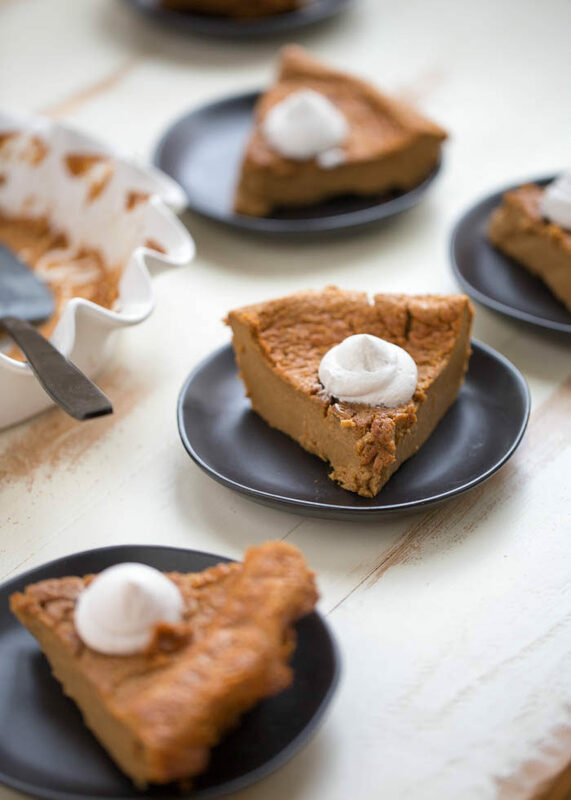 I haven’t had pumpkin pie in years so I’ve been wanting to make one for Thanksgiving this year…this recipe looks easy enough that it won’t be too labor-intensive amongst all the other dishes I’ll be making. I’m trying to make as many dishes in advance as possible to make things even easier on myself, I’m wondering if you have any idea if this recipe would freeze well? I may just make it the 3-4 days in advance as mentioned in your recipe, but I’d love to make it now so I don’t have to worry about it later! Thanks for the recipe! Let me know how it turns out for you! I meant to try it the other night, but…my pumpkin puree was frozen (doh!). Waiting for it to thaw now and will hopefully get around to trying this in the next few nights! Woo hoo! I feel like this pie was a labor of love – I tested it SO MANY TIMES. So your comment totally makes my morning. 🙂 Thanks! Have you tried substituting an egg replacement? 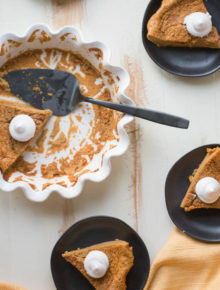 I need to make a pumpkin dessert for Thanksgiving that is friendly to a multitude of allergies, one of them being eggs. That is the one thing I have not tried, but I will try it today with flax egg and report back! I have a feeling it won’t set up quite as well but you never know. Thanks. I will be watching for your report. I sure hope it works. I will keep trying, but not sure I’ll have an egg-free version in time for this Thanksgiving Day! So sorry! Made the dairy-free impossible pumpkin pie today. It was super easy and delicious. Was able to find liquid coconut creamer in the refrigerated section of Whole Foods, which made the recipe even easier. Thank you for this recipe! I give it 5 of 5 stars! Couldn’t leave a review for some reason but this is incredible! So simple and my family loved, can’t believe it was all made in my vitamix! Thank you!! Do you think this mix would work in a (sorry) storebought crust?? Hmm … that I’m not sure of. It is a bit runnier than your typical pumpkin pie filling so I’d worry about how that might effect the outcome. Also, could I substitute coconut sugar? Thanks! I think that would work. I almost tried it but wondered if the coconut sugar would impart too much of a nutty taste, so I haven’t yet. If you try it please report back on how it goes! Can you use a canned pumpkin? Can this recipe be put in to a piecrust? The crust is one of my favorite parts !!! Love tis recipe as it is, but upon request, I just made it with the addition of fresh ginger and a graham cracker crust, it’s cooling now and we can’t wait to taste test it! Smells warm and cozy. I have already made this 3 times this holiday season. My favorite go to recipe. Thank you for sharing your recipe!! Hi Kelsey, I’m so glad you like this recipe! It’s almost dangerously easy, isn’t it? Hahah. Happy holidays to you! Loved this recipe. I made the following substitutions: 1/3 C. Agave instead of 1/2 C. Sugar; 1/2 C. Bob’s Red Mill Gluten Free Mues;i, fround fine instead of flour. Turned out wonderfully. Thank you. Thanks so much for sharing! Happy Holidays to you!